As Barack Obama made history when he became the first African-American president of the United States, Kehinde Wiley made history nearly ten years later to become the first African-American to paint a presidential portrait. President Obama’s portrait, painted by Wiley, went on display at the Smithsonian National Portrait Gallery on February 12, 2018. It shows the 44th president of the United States seated in front of rich green foliage, punctuated with colorful flowers. Unlike previous presidents, President Obama sits in his portrait, relaxed and casual instead of formal. The flowers in the rich background denote President Obama’s life experiences: chrysanthemums for the city of Chicago, jasmine for Hawaii, and African blue lilies which refer to his Kenyan ancestry. Kehinde Wiley’s work often mixes every day people with classic art motifs. He is also known for re-creating poses, styles, and techniques from older artists like Titian and Rembrandt in new exciting portraits. Kehinde Wiley’s work was displayed at the Virginia Museum of Fine Arts in Fall 2016. 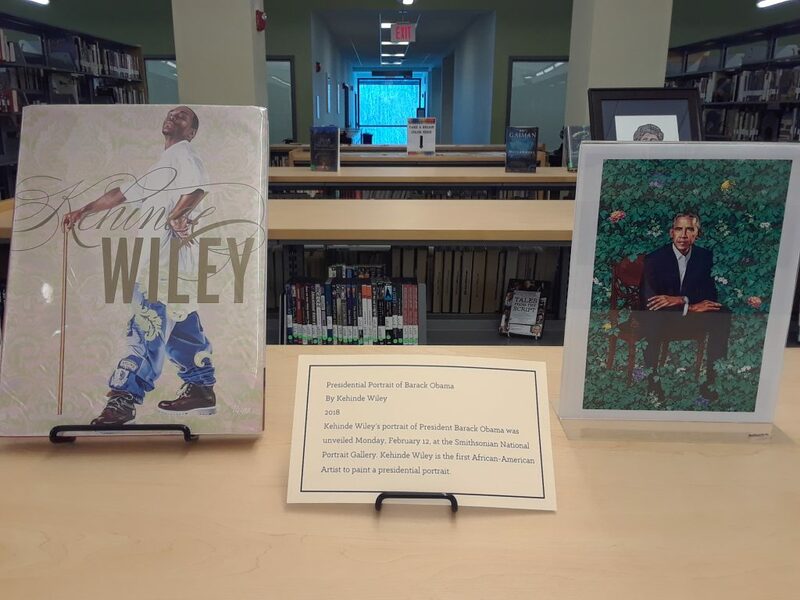 A book of his work and a printout of the presidential portrait are on display at the Midlothian Library. Come check it out, along with our new student artwork!